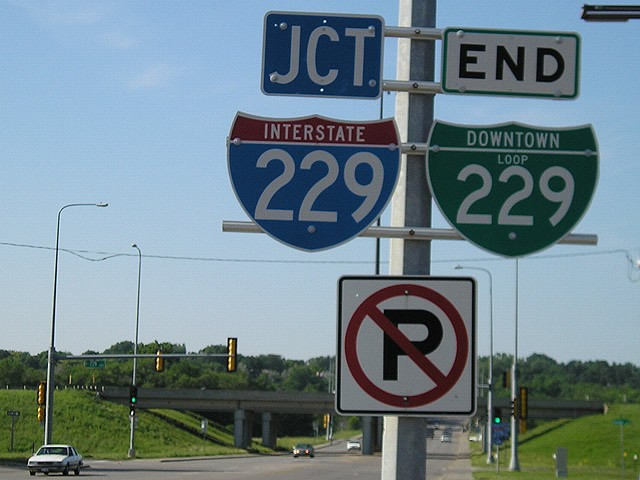 Two well signed business routes join I-29 with St. Joseph, Missouri and Sioux Falls, South Dakota. I-229 also has a business loop. Interstate 229 loops west from I-29 to Downtown St. Joseph along the Missouri River while I-29 bypasses the city to the east. In addition to the urban freeway loop, a 14.066 mile Business Loop travels surface roads through St. Joe. Business Loop I-29 veers northwest from Exit 44 with U.S. 169 along a four-lane arterial (Belt Highway) to Pear Street. U.S. 169 stays north parallel to I-29 while the business route follows Pear Street west and Garfield Avenue north adjacent to a BNSF Railroad. The locally maintained section separates into a couplet along 9th and 10th Streets (old U.S. 59) across Downtown. The one-way pair combines along Frederick Avenue at Francis Street (old U.S. 36 / Missouri 6) by St. Joseph City Hall. The three-lane boulevard angles northeast to Highly Street, and east back to U.S. 169 (Belt Parkway) at East Hills Mall. Belt Parkway constitutes a commercial arterial northward to the Andrew County line, and a rural divided highway from the village of Country Club to I-29 at Exit 53. Business Loop I-29 overlaps with U.S. 169 from Frederick Boulevard to Rochester Road and U.S. 59 from Country Club Road to Interstate 29. 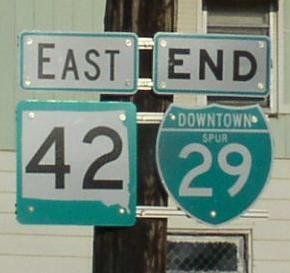 The 2.679 mile state maintained route loops east from Interstate 29 along 477th Avenue and Main Street through the city of Elk Point. The route is well signed between Exits 15 and 18. Dating back to at least the mid-1960s, Business loop I-29 was designated over local roads, as U.S. 77 followed Rose Street to the northeast of the Elk Point business district. Business Spur I-29 & South Dakota 42 provide a direct route to Downtown Sioux Falls along 12th Street (old U.S. 16) east to Menlo Avenue and the one-way pair of 10th and 11th Streets. 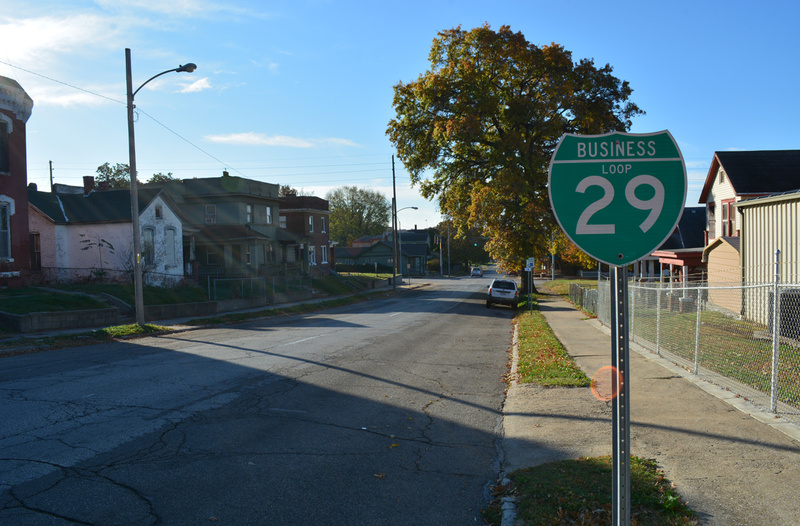 The 2.5 mile route concludes at Minnesota Avenue, where Business Spur I-90, Business Loop I-229 and SD 115 come together. 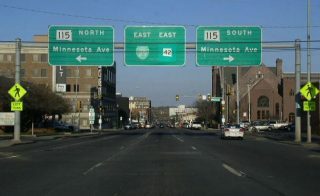 Downtown Sioux Falls is the only city with two Interstate business spurs and a business loop intersecting at the same place. Minnesota Avenue north leads to Sioux Falls Regional Airport (FSD) and I-90 as Business Spur I-90 & SD 115. Business Spur I-229 turns from Minnesota Avenue (SD 115) and the All Saints neighborhood to the south of Downtown onto 10th / 11th Streets to the Whittier community east of the Big Sioux River. All business routes within the city of Sioux Falls were transferred from SDDOT jurisdiction to city maintenance in 2006.2 As South Dakota allows for locally maintained routes to be signed as state highways, the three business routes remain posted. 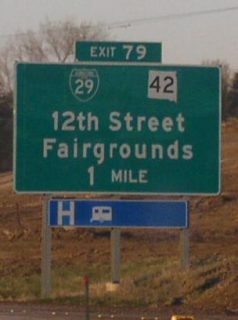 Previously referenced as a business loop between Exits 127 and 132, signs along Interstate 29 were eventually changed to reference a Business Spur for I-29 at U.S. 14 (6th Street). The route is unsigned along 6th Street at Medary Avenue (old U.S. 77) in Downtown Brookings. 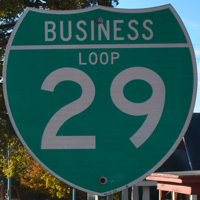 An August 2016 visit to the city revealed a Business Loop I-29 shield posted at the northbound off-ramp (Exit 132) as the lone marker for the route. The business loop was commissioned sometime after the early 1990s3 and thought to run west from Exit 127 along 217th Street to County Road 77 (old U.S. 77) north. CR 77 becomes Main Avenue north en route to the city center, where the loop may have turned east along side U.S. 14 (6th Street) to I-29. Chris Geelhart noted a different set of end points, with the business route looping west between Exits 132 and 133,3 perhaps along Medary Avenue from U.S. 14 (6th Street) to U.S. 14 Bypass (18th Street). Widening of Interstate 29 through west Sioux Falls expanded the freeway to six and eight lanes and modified several interchanges during projects completed from 2003 to 2006. Work at Business Spur I-29 & SD 42 upgraded Exit 79 to a single point urban interchange (SPUI). These photos taken by Bill Burmaster (2003) show former guide signs for the 12th Street off-ramp. 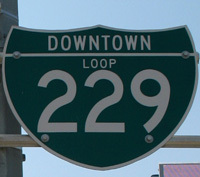 I-229 through Sioux Falls comprises an urban loop and commuter route connecting Interstates 29 and 90. The freeway bypasses the city center to the east while I-29 stays well to the west. Business Loop I-229 connects Downtown Sioux Falls with I-229 to the south via Minnesota Avenue (old U.S. 77) north from Exit 3 and 10th and 11th Streets (old U.S. 16) west from Exit 6. The 4.4 mile route overlaps with SD 115 on the north-south leg and SD 42 along the east-west leg and couplet of 10th/11th Streets. 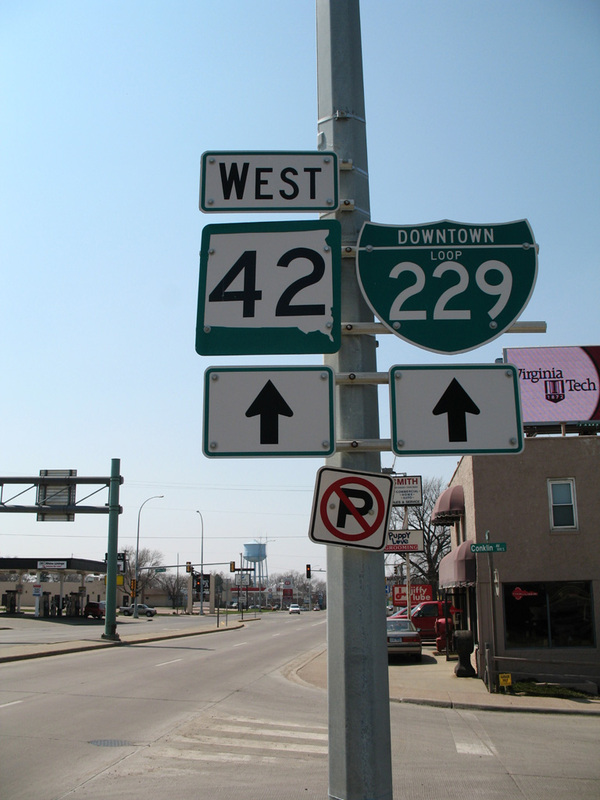 Many of the signs for Business Loop I-229 were removed during a construction project in 2003.3 These were restored by 2007, following a maintenance transfer of the route from SDDOT to the city of Sioux Falls. 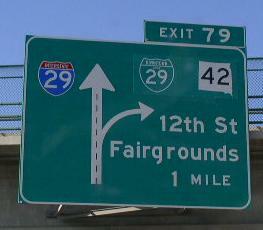 Like the other business routes in Sioux Falls, signs for BL I-229 often display "Downtown" in place of Business. 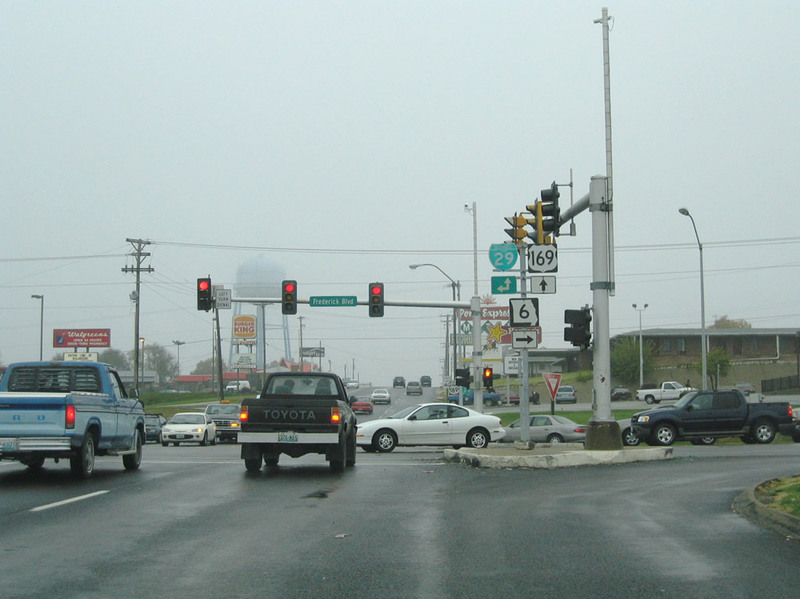 U.S. 169 (Belt Highway) north recombines with Business Loop I-29 at Frederick Boulevard as Missouri 6 begins to the east. Photo taken 11/03/03. 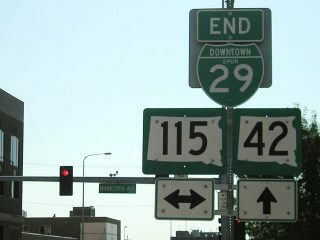 This end shield for Downtown Spur I-29 at South Dakota 115 (Minnesota Avenue) was replaced by 2006. Photo taken by Bill Burmaster (2003). The replacement assembly for the Downtown Spur I-29 east end added a shield for SD 115. This set of signs was short lived, as they were gone by 2008. Photo taken by Jeff Morrison (06/26/06). SD 115 is a locally maintained route within the city of Sioux Falls. 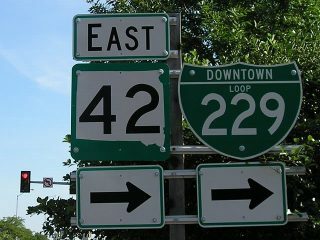 It was designated to replace U.S. 77 when it was decommissioned. A set of overheads once directed traffic at the east end of Business Spur I-29, where 12th Street intersects Minnesota Avenue (SD 115). It was removed by 2006. Photo taken by Bill Burmaster (2003). The green out covering South Dakota 38 on the pull through panel for Business Spur I-29 incorrectly displayed it as continuing. SD 38 ends at the Sioux Falls city line to the northwest now, but it previously followed Russell Street southeast to West Avenue. It accompanied Business Spur I-29 east as part of replacement route for U.S. 16 east to I-229 and Cleveland Avenue. Downtown Loop I-229 turns east from Minnesota Avenue (SD 115) to overlap with SD 42 along 11th Street to the Whittier neighborhood. Photo taken by Jeff Morrison (06/26/06). An end shield for Business Loop I-229 precedes the diamond interchange where Minnesota Avenue (SD 115) meets I-229. Photo taken by Jeff Morrison (06/26/06).